Mackie Shilstone created the Fat-Burning Bible so as to eliminate the confusion that most dieters have about what is the best way to eat and exercise. Shilstone is experienced in nutrition, fitness, and sports medicine and has helped over three thousand top athletes to improve their performance, as well as thousands of ordinary men and women to achieve their weight loss goals. He says that if you faithfully follow his diet and fitness plan you will be able to lose 14 to 16 pounds in one month. In the first part of the book Shilstone outlines several key concepts including the health risks of being overweight, the role of metabolism in fat loss and the hormonal differences between men and women. He also describes the changes that occur during menopause and andropause and explains how to ease the transition as much as possible. In part two several self-assessment questionnaires are included that will help you to evaluate your current state of health as well as your ability to effectively cope with stress. Part three goes into the benefits of exercise and outlines a Fat-Burning Metabolic Fitness Plan. The dietary aspect of the program involves three meals and two snacks daily to keep your energy levels consistent. Shilstone says that whenever you go more than four hours between meals, you should make sure you have a snack to keep your metabolism high and your insulin levels even. The meal plan is based on a balance of 30% protein, 40% carbohydrates and 30% healthy fats and is very similar to the Zone Diet. The book includes low-glycemic meal plans and recipes that were developed by collaboration between a nutritionist and a chef. Shilstone also recommends a variety of supplements to increase metabolism including calcium, magnesium, chromium picolinate, coenzyme Q10, acetyl L carnitine and green tea extract. Fruit, vegetables, egg beaters, tuna, salmon, shrimp, chicken, beef, soy products, whey protein, low fat cottage cheese, light yogurt, oatmeal, basmati rice, whole grain bread, whole wheat pasta, nuts, legumes, dark chocolate, sugar free pudding, protein bars. Shilstone says that women burn more body fat at low to moderate levels of intensity, whereas men require moderate to high intensity exercise. The exercise programs in the book are designed to take advantage of this knowledge so that you can boost your metabolism and burn the most amount of fat for the least amount of effort. perform 300 minutes of exercise per week that is spread over six days. As you progress through the program the duration of exercise will gradually decrease until you reach a maintenance level of 150 minutes per week. 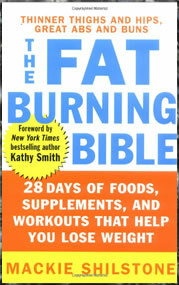 The Fat-Burning Bible retails at $14.95. Good for dieters who like to understand the science behind weight loss. Provides a balance of proteins, essential fats and low glycemic carbohydrates. Does not reduce calorie intake too low so as to avoid physical or emotional stress and fatigue. Frequent small meals reduce likelihood of experiencing hunger. Provides meal plans for different calorie levels. Includes a large variety of recipes. Provides information on how to identify and manage hypothyroidism. Acknowledges the role of stress management in weight loss. Requires meal planning and food preparation. Many of the recommended supplements are very expensive. Encourages the intake of processed soy products such as protein powders and fake meat products. Requires gym visits in order to undertake the fitness program as it is prescribed. The Fat-Burning Bible will most appeal to dieters who like to understand the science behind weight loss and are interested in undertaking a comprehensive diet and fitness program. I am trying to balance my diet but I am allergic with anything that comes from the sea ! !